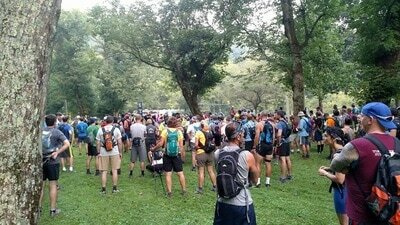 Run or hike on gorgeous, challenging trails in September - while supporting Pennsylvania's only statewide hiker advocacy and trail maintaining organization, Keystone Trails Association! We are excited to offer the 11th annual KTA Trail Challenge, featuring two courses to choose from: 25k and 50k! New to this event? Is 50k too daunting? The 25k option is sure to provide trail enthusiasts of all ages and abilities with a challenge that they'll remember fondly! Trails, stream crossing, ravines, hills, and vistas are all part of this course. The 25k begins at beautiful Susquehannock State Park. The 50k is for trail runners and fast, fit hikers -- a difficult course that will test the limits of even the most prepared individuals. Four KTA Organizational Members are responsible for building and maintaining the Mason Dixon and Conestoga Trails and have been hard at work preparing the route for this event: the York Hiking Club, the Lancaster Hiking Club, The Lancaster County Conservancy, and the Mason Dixon Trail System.Without their efforts, the KTA Trail Challenge would not be possible! 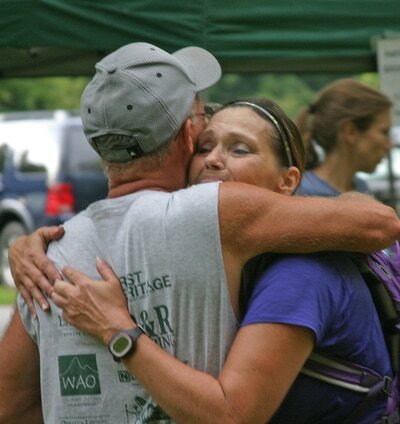 Volunteers ARE NEEDED for the KTA Trail Challenge. Many volunteer opportunities are available including registration (Saturday morning), parking, checkpoints, trail sweeps, and more. Approximately 120 volunteers are needed. Sign up to volunteer here. The course has been restored after 2018 storms. The segment between Pequea Creek Campground and the Pinnacle Overlook is the most strenuous and most rewarding of the KTA Trail Challenge, and follows the orange-blazed Conestoga Trail. Participants face this section in the morning when temperatures are lower and legs are fresher. Leave Pequea Creek Campground along Pequea Creek for just under a mile. Follow the unpaved road along Pequa Creek, lined with cottages and turn left at the Pequea Boat Club and left again, up the hill. At the second intersection, turn right on Ridge Road. Trail leaves road and turns left uphill into woods, then crosses two roads and descends to a stream and an old springhouse. The trail then climbs steeply towards the entrance to Wind Cave, one of the largest tectonic caves (formed by the movement of masses of bedrock) in the eastern US. Trail climbs, then descends to House Rock Run. Climb to House Rock Vista with excellent views and climb over rock formations, descending to Brubaker Run. Climb out of Brubaker Run and then descend to Reed Run. Climb out of Reed Run and then descend to Tucquan Run, a nature preserve and a jewel of the KTA Trail Challenge. Cross stream turn right up gorgeous Tucquan Run then reach railroad tracks and turn left. Re-enter woods and ascend steeply, eventually passing a rock overhang. Pass Lower Rock Vista with incredible views of the Susquehanna River. Continue to top of hill to Pinnacle Vista with stunning views and Checkpoint 1. Descend from top of hill to gas pipeline with views across the river. Continue descent to Kelly’s Run, another highlight of the KTA Trail Challenge featuring water, rocks, hemlocks and rhododendron. This area is slippery, so use caution. Ascend from Kelly’s Run to Holtwood Recreation Park with restrooms and water. Follow trail to Face Rock Overlook and remnants of the abandoned village of Holtwood. Follow trail to Rt. 372, turn right and cross the Susquehanna River on the Norman Wood Bridge. Caution: run/walk in single file facing traffic. Turn left (south) at River Road after crossing the Norman Wood Bridge. Turn left, down towards the river on the blue-blazed Mason-Dixon Trail. Climb down large rocks and descend hill. Follow MDT under Norman Wood Bridge and continue on to Lock 12 and Checkpoint 2. From Checkpoint 2, the course follows the blue-blazed Mason-Dixon Trail. Pass restrooms to your right, then picnic tables, and cross a small bridge to the restored Lock 12. Follow the towpath of the old Susquehanna and Tidewater Canal. Trail continues behind a large mill foundation, turn right on River Road to cross Mill Creek. Turn left and follow lovely Mill Creek upstream, passing a nice waterfall along the way. Turn right off stream and ascend by switchbacks to the top of the ridge. Pass two rock outcroppings with excellent views, and descend more steeply on switchbacks. Pass powerline vista with excellent views of the river and Holtwood Dam. Route bears left through the foundation/ ruins of an old hotel. Turn left at the river and follow a combination of lowland trails and roads. Turn left on beautiful Oakland Run and ascend steeply to a large rock outcrop. The cascades and deep pools along the run make this one of the highlights of the KTA Trail Challenge. Descend gradually and cross the stream. Ascend from Oakland Run on maintenance road to gate and Checkpoint 3. Leave Checkpoint 3 on state forest road, turn left at T onto Posey Road. Turn right on Newcut Road, then cross Rt. 425 through woods and skirting fields. Trail turns right on Bare Road. Turn left on powerline maintenance road. Turn right into woods and then descend into hollow and cross Furnace Run. Turn right and follow trail along Furnace Run as it parallels the stream. Turn right and cross Furnace Run on Sawmill Run Road as it parallels Sawmill Run on left. Trail turns left off Sawmill Run Road on switchbacks and descends to Sawmill Run. Cross bridge and follow to Otter Creek Campground, where there will be a water station for those going 50 kilometers, and the finish line for the 25k. After leaving the water station, turn left and go up and out of Otter Creek Campground. The course follows an old logging road through state game lands until it reaches Kline Road. Follow the lime green blazes for the first part and then follow the marking tape. Turn right on Kline Road, and cross the bridge over Otter Creek. After passing a powerline, look for the blue-blazed Mason-Dixon Trail on the right. The trail follows Otter Creek for 1 kilometer before ascending a series of switchbacks until reaching Rt. 425. Cross Rt. 425 and follow logging road to Urey Overlook and a beautiful vista of the Susquehanna River. The trail then descends by switchbacks, where it crosses over two streams. Turn right after the second stream onto a logging road, and follow the trail as it crosses Rt.425 and descends to Otter Creek. The trail, with a few ups and downs, mainly follows the creek to the Rt. 425 bridge. Turn right and cross the bridge just north of the campground. Turn right off Rt. 425 and enter campground to the 50k Finish Line. ALL PARTICIPANTS MUST FINISH BY 7:00 P.M. Participants will start adjacent to the pavilion and proceed onto the Overlook Trail, continue onto the Fire Trail, then go straight onto the Holly Trail. Near the bottom of the hill take the Rhododendron Trail and go past the Neel Homestead Foundation and old spring. The course eventually comes out at Wissler Run. Cross Wissler Run and follow the flagging up the side of the ravine. Your feet will get wet crossing over Wissler Run and a bushwhack is flagged up the side of the ravine!! Climb over the guard rail and head uphill on the power plant road. At the top of the hill, turn left on River Road. Proceed on River Road approximately two miles to Rt. 372. Turn left on Rt. 372 and cross the Norman Wood Bridge. At the end of the bridge turn right down to Lock 12 and the checkpoint. From Checkpoint 2, the course follows the blue-blazed Mason-Dixon Trail. Pass restrooms to your right, then picnic tables, and cross a small bridge to the restored Lock 12. 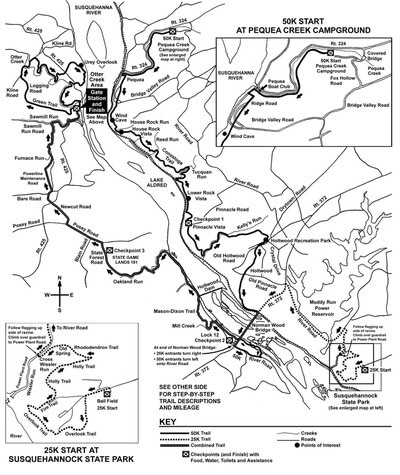 Follow the towpath of the old Susquehanna and Tidewater Canal. Trail continues behind a large mill foundation, turn right on River Road to cross Mill Creek. Turn left and follow lovely Mill Creek upstream, passing a nice waterfall along the way. Turn right off stream and ascend by switchbacks to the top of the ridge. Pass two rock outcroppings with excellent views, and descend more steeply on switchbacks. Pass powerline vista with excellent views of the river and Holtwood Dam. Route bears left through the foundation/ ruins of an old hotel. Turn left at the river and follow a combination of lowland trails and roads. Turn left on beautiful Oakland Run and ascend steeply to a large rock outcrop. The cascades and deep pools along the run make this one of the highlights of the event. Descend gradually and cross the stream. Ascend from Oakland Run on maintenance road to gate and Checkpoint 3. Leave Checkpoint 3 on state forest road, turn left at T onto Posey Road. Turn right on Newcut Road, then cross Rt. 425 through woods and skirting fields. Trail turns right on Bare Road. Turn left on powerline maintenance road. Turn right into woods and then descend into hollow and cross Furnace Run. Turn right and follow trail along Furnace Run as it parallels the stream. Turn right and cross Furnace Run on Sawmill Run Road as it parallels Sawmill Run on left. Trail turns left off Sawmill Run Road on switchbacks and descends to Sawmill Run. Cross bridge and follow to Otter Creek Campground, where the finish line will be. ​ALL PARTICIPANTS MUST FINISH BY 7:00 P.M. Questions? Contact Cameron Elo, at ktaadmin@kta-hike.org.